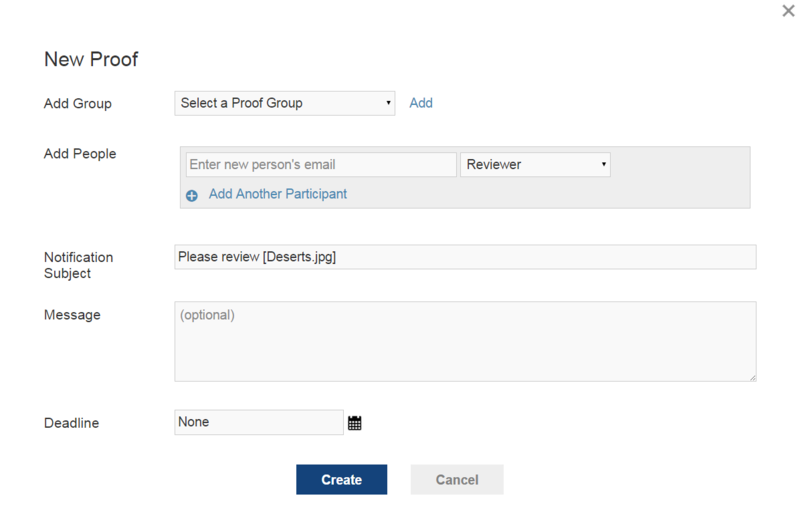 Review and Approve allows users to provide in-line edits and comments directly on creative proofs, resulting in faster, more efficient review cycles. Please note that not all file types are supported. Be sure to take a look at the Review and Approve File Types that can be converted into proofs. 1. Navigate to the desired media file and click Proof Action > Create. 2. Using the light box, add approvers, customize the notification, and set an optional due date. Note: Approvers do need not be a member of your iMeet® Central company or workspace in order to be added to a proof. The names that appear in the user picker are all members of the company or any non-members that have been added to proofs in the past. Email notifications are sent to all approvers associated with the proof. The subject and description of the notification are customizable. Use the calendar picker to give the proof a date and time deadline for the decision. To edit approvers or adjust the settings of an unlocked proof, click Proof Action > Edit Proof. If a proof is locked, only the proof creator can make changes to the proof. Note: Only the proof owner can edit a proof. Click Proof Actions > Delete Proof to delete the proof and all proof activity, such as comments and attachments. This option deletes the proof, but the original uploaded file will remain in iMeet Central. A new approval process can be started again by clicking Start Online Proof. To access the proof settings select Proof Action > Edit. Approvers can be added or removed, roles can be updated, and proofs can be manually closed. Lock and close a proof manually by selecting Lock and Close Proof. This will change the proof status from 'Pending' to the lowest decision made (i.e., 'Changes Required'). If no decisions have been made, the proof status will change from 'Pending' to 'Not Relevant'. You will not be able to upload a new version in the current proof thread. A new proof thread will begin. Complete proof after one decision: once the proof has been approved by one user, the proof will be locked and closed. Allow people to add themselves: this allows any person with the proof URL to add themselves to the proof.